I signed onto the Kickstarter campaign for Furrow Books roughly 6 or so months ago. I pledged for one of the founding member pocket sized notebooks. Its price was fair to help support the campaign. The pocket sized notebooks are 3.5×5.5 inches in size and contain 48 pages. 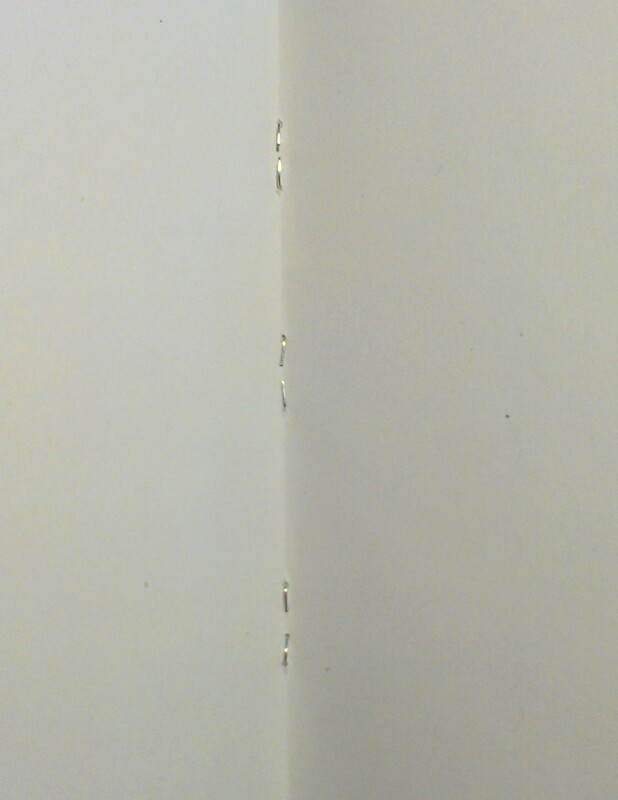 The pages are held to the cover by 3 silver staples. 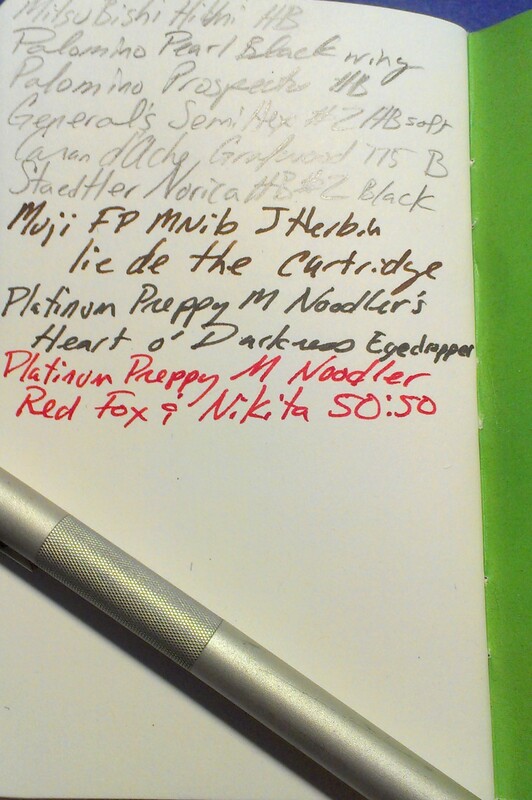 This is all pretty standard in the pocket sized notebook arena. The front cover is unadorned and is a nice dark shade of green. The back cover has some information about the company and the book. Because this was a limited edition of 1500, it sports a hand numbered 0044/1500. 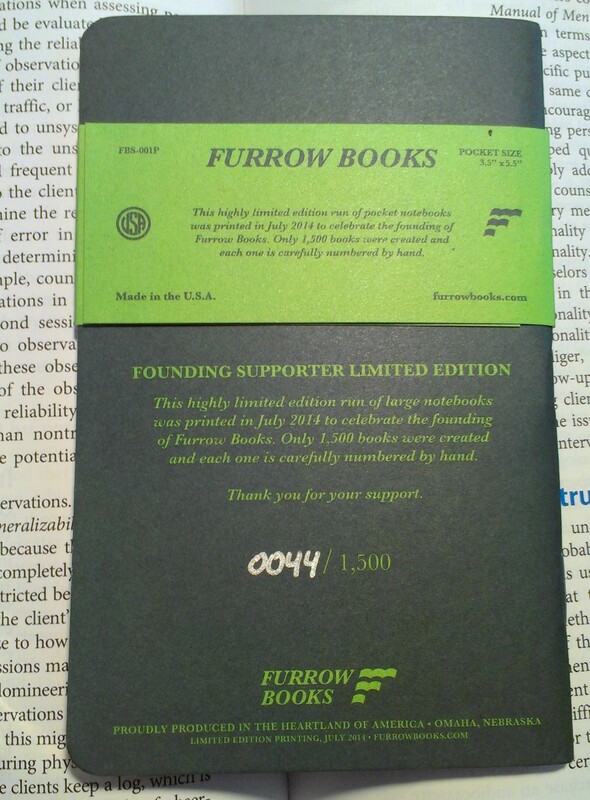 At the bottom of the back cover is the furrow books logo. The cover is made of stiff sturdy card. I really dig the logo free front cover. 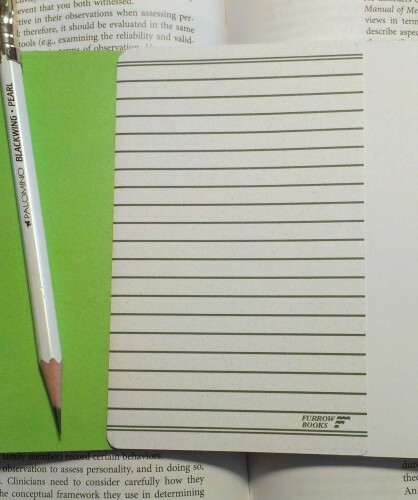 Inside the covers are colored the original Kickstarter green* and they are blank. They don’t have a place to put your information but this is easily enough to be scrawling in with ink. The pages are blank. 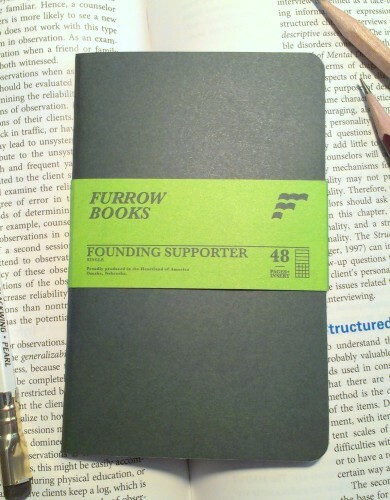 Furrow books schtick is that their pages are blank, but that they have a card with lines that you can stick behind them and use as a guide. The pages are just thin enough that you can see this guide well enough to, uh, guide your writing. In practice this works pretty well. 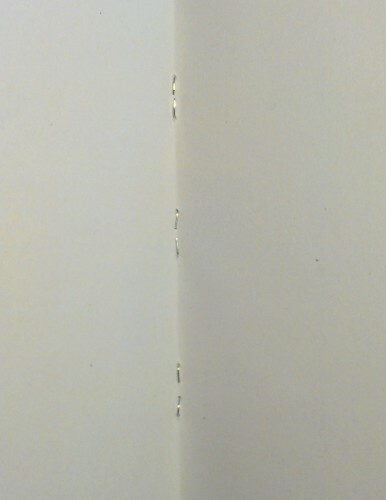 I found shoving the card behind every page a tad annoying** but for specific reason which will likely not annoy anyone else (read the footnote for more info on this.) Using the notebook in my cover meant that the elastic pushed the card out of place. Outside the cover it worked pretty well. I really liked the fact that once I was done there were no lines visible on my page and yet my writing was perfectly straight. Like lines? That’s covered. Like grids? That’s covered. The card is double sided to accommodate what you prefer. While using a pencil I found that my card got a little graphite transfer. This wasn’t an issue in use just a thing to make note of. It wouldn’t happen with fountain pens. As someone who interchangeably uses fountain pens, pencils and cheap roller balls it’s important that I know what kind of utensil will work on my paper. I found that pencils worked the best on this paper, in fact they worked so well I found myself using little else. 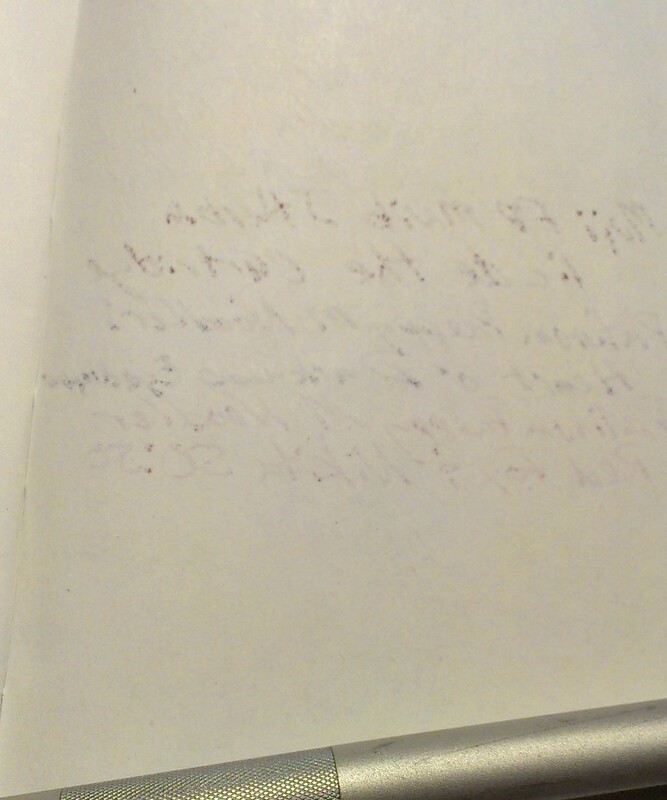 I did test out the Field Notes clic pen to good effect. 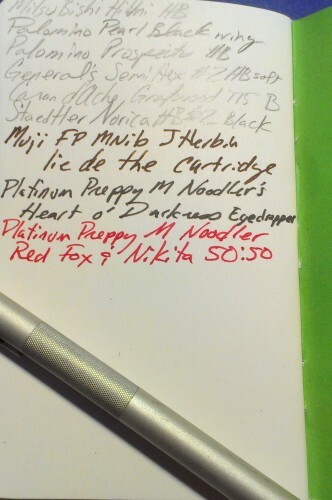 I tested out a few of my fountain pen stash and the results were ok. I had a lot of show through and a touch of bleed through. YMMV. I really liked it with pencil, and I would put it on par with some of my other favorite notebooks with pencils. Overall this is a pretty nice notebook with great paper that is made well here in the US. The aesthetics are significantly different than Field Notes and approach a classy simplicity in the choice of cover materials and treatments. These notebooks would look good in an office, board meeting, or a meeting with nerdy professors. The branding is subtle and adult, sophisticated. 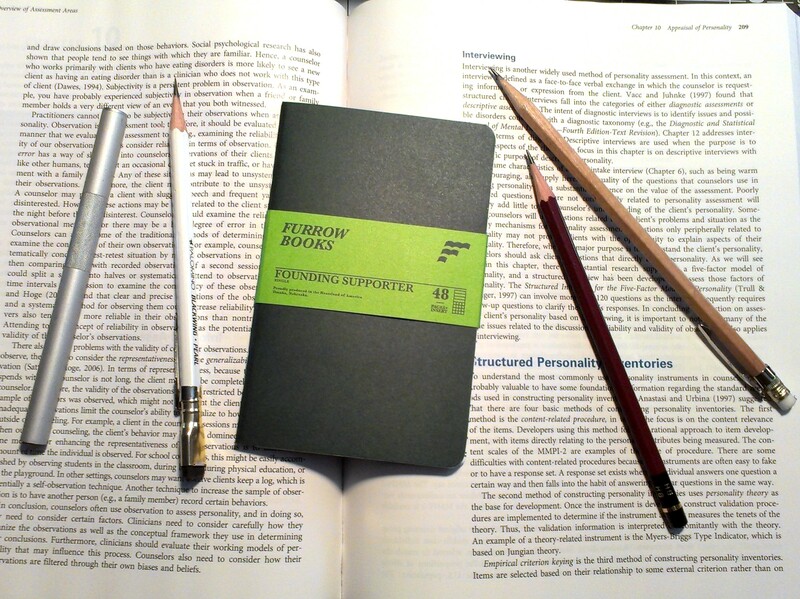 Again,, comparing them to Field Notes, they lack the fun factor, but make up for it by being an adult notebook. 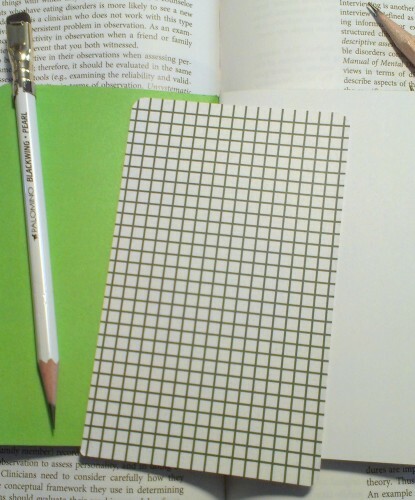 While I was a Kickstarter Supporter, I suggest that people keep an eye out for these notebooks and support them. MAde in the USA, quality construction (when compared to other notebooks of similar build) and a nice look. How can you go wrong? *instead of the new ugly seafoamy nasty kickstarter green. **Because of how I set up my notebook/journal I’m constantly referring back to my first 6 pages. Having to move the card back and forth is what annoying me. When I changed my journaling set up about halfway through my use of this notebook, my annoyance diminished noticeably as I was merely moving the card forward, instead of back and forth. My understanding is that each 3 pack of notebooks arrives with a card, so if you buy several packages you will have several cards to work with, so after awhile, you wouldn’t need to move back and forth but leave one card where you need to have it. Or dispense with the cards on the previous pages… Or something. This is neither here nor there and merely me going off on a tangent. 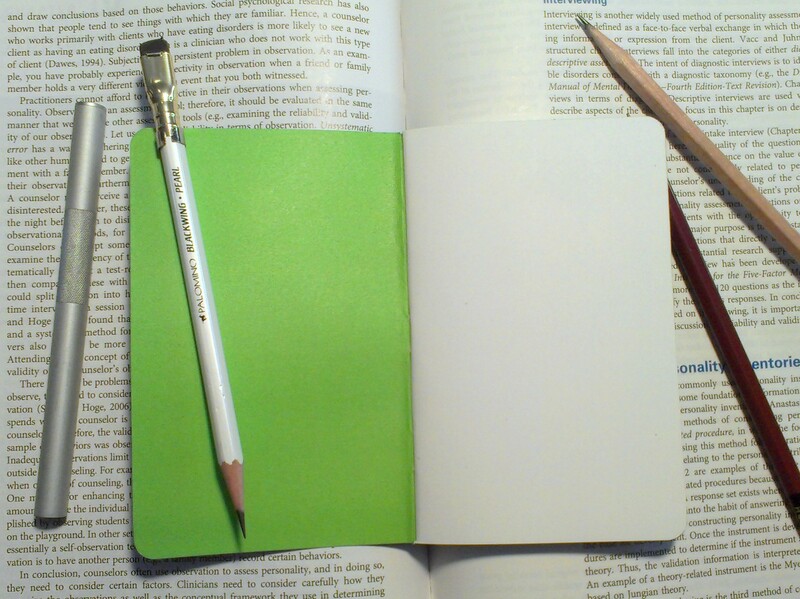 This entry was posted in Review and tagged classy, Furrow Books, notebook, notes, pocket, simple, small notebook, sophisticated on 20141021 by leslie.